THE GORDON MOTE CONCERT SCHEDULED FOR DECEMBER 15TH HAS BEEN CANCELLED. SORRY FOR ANY INCONVENIENCE THIS MAY HAVE CAUSED. 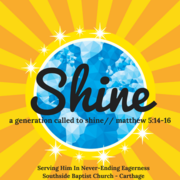 SHINE Kidz Zone kicks off September 5, 2018 at 6:30 pm. The women's ministry meets at 6 pm on the first Monday of each month during school months. Our BOLD Men's Ministry meets the 1st Sunday of each month at 8:00 am at Rose Hall located at Southside Baptist Church. Men of all ages, members or non-members, are invited to fellowship and have a warm breakfast while listening to a devotional.